Home > U.S. Immigration > Can my green card be taken away? Once you receive a permanent green card, there are only two conditions required to keep it for life, which are both easy to meet. First, you must not be deemed ‘removable’ by the U.S. authorities. The most common ways of becoming removable are to be convicted of a crime, or to be found guilty of fraud in your green card application. The second requirement is that you do not abandon the United States as your permanent place of residence. As long as you are not planning to make your home somewhere else, then legally you are still a resident of the United States. Problems may arise, however, if you are spending extended periods of time outside of the U.S.
What actions would make me ‘removable’? 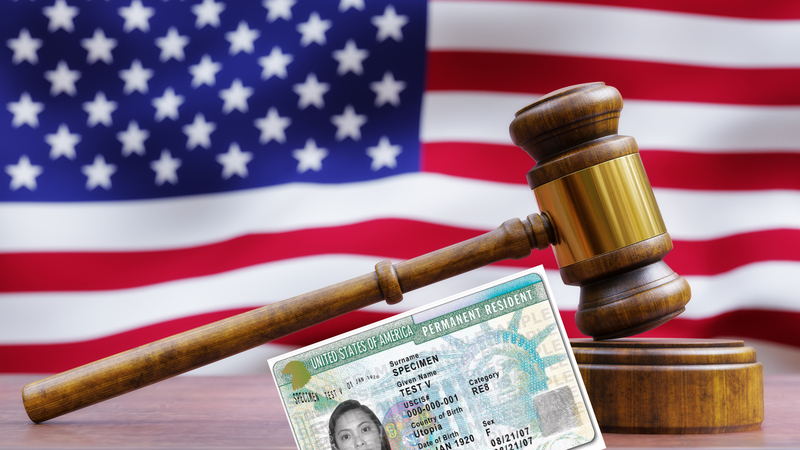 If you lied or omitted relevant information on your application, or if the source of funds information provided by you is not accurate, and this is discovered after your green card has been granted, your green card (and therefore permanent residency status) may be revoked. If you commit a serious enough crime, it may be grounds for deportation and the revocation of your green card. It’s difficult to outline exactly which crimes could result in deportation, as it would depend on the facts of the case, and the laws of the state you were convicted in. Registering to vote, or voting in a U.S. federal election, is considered a crime if you are not a U.S. citizen, and may result in deportation. Green card holders are required to report any change in address to U.S. Citizenship and Immigration Services (USCIS) within ten days of moving. Once you’ve obtained a green card, you are expected to establish a residence and live in America. At some point, you may be asked to prove this (for example, if you plan to apply for U.S. citizenship). Your immigration attorney will provide guidelines on how to ensure you meet the necessary requirements, particularly if you intend to spend extended periods outside of the U.S.
What is ‘abandonment of permanent residence’? If a green card holder remains outside of the U.S. for more than 180 days per year, he or she may be seen to have abandoned their green card status, which means it could be revoked. There are ways to work around this, however. If you need to travel outside of the U.S. for an extended period, you should apply for a re-entry permit before you leave, and you may be required to provide the authorities with documentation to show that you do not intend to abandon your status as a permanent resident. Ways to show you have established residency in the U.S.
Buy a home in the United States or sign a long-term lease. Work, bank, and invest in the United States. Pay your U.S. taxes on time and keep records. Obtain a re-entry permit if you’ll be outside of the U.S. for more than 6 months at a time. Obtain a state-issued driver’s license. Join groups or organizations to demonstrate that you have become part of a local community in the U.S. These are general guidelines, and your immigration attorney will be able to provide more detailed information if you require it.